Move over cat cafés! 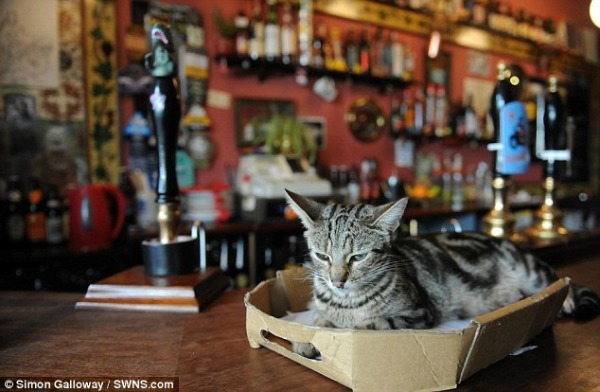 Make room for... the cat pub! 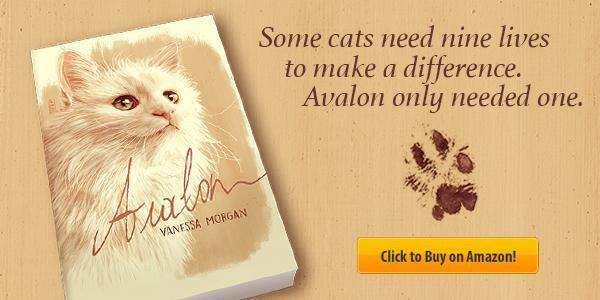 A cat pub isn't for those who love cake and coffee and all things cozy. Here, you're getting the real deal: beer and all other sorts of alcohol. If this sounds appealing to you, I have good news. 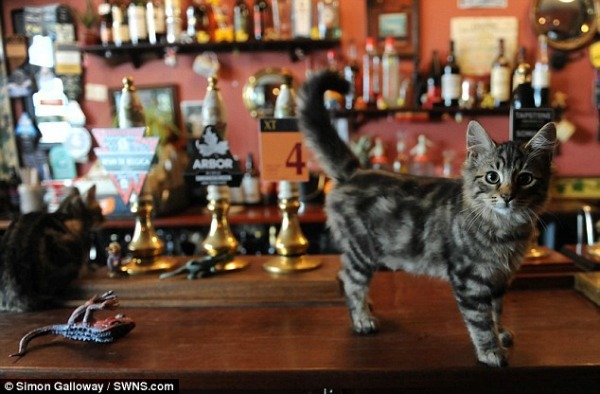 The first-ever cat pub just opened in Bristol in South West England. The Bag O' Nails the cat pub is called. However, the feline souls of the Bag O' Nails pub don't like alcohol. Instead they'd do anything for a saucer of cat milk. The pub counts fifteen resident cats. All except one were born in the pub. The youngest one arrived in a box during quiz night. 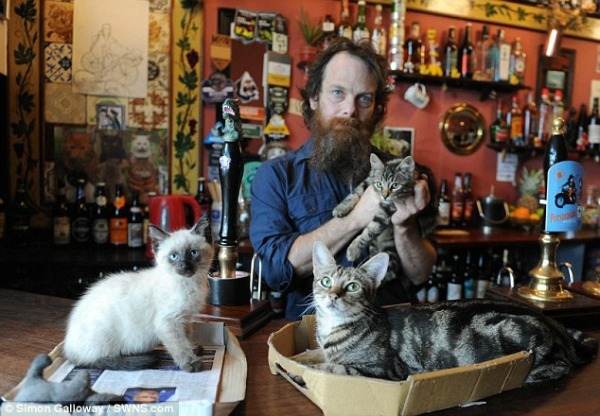 "It's a proper old fashioned pub," says cat pub owner Luke Daniels "Coming here is all about beer and talking." 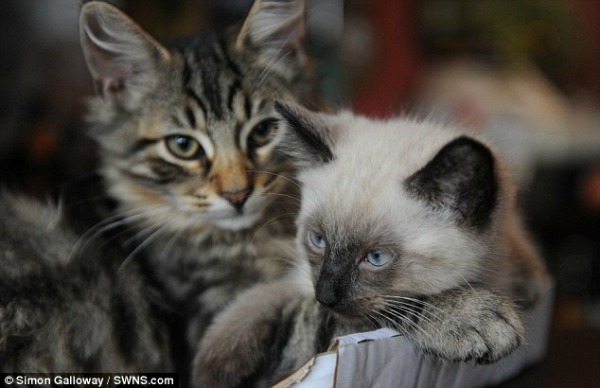 The RSPCA warns, though, not to give any alcohol to the cats because it can cause serious harm and suffering. Check out Trip Advisor for more info and pictures of the Bag O' Nails cat pub. What beautiful cats, we love our kitties and after about 4 years I have given my girl kitty a nick name of my black velvet kitty!! How awesome! Love those pictures. Our first cat cafe in the state will open next month right here in our town. I wonder if one of the drinks they serve is a PURRalizer? OMG, I want one here!! 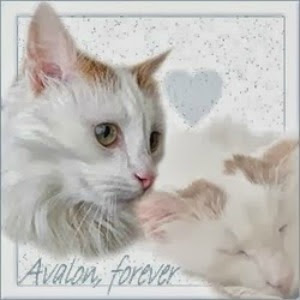 What lovely cats and photos heheh! Beautiful pictures, love the second and the last shot. Thank you for joining our linky party, I ma sure you notice that this week we did not have the image linky up, sorry for that. However now it is up. In order not to loose does of you that had already linked we did keep the "text-Linky" up but if you would like to add your linky to the image one that typically has more clicks feel free to come over and link. I apologies for the inconvenience. Oh my goodness, that's a whole big bunch of cuties!!! I wish I was there! It Seems a nice place to be and drink coffee! So many colors! So many... sizes!!! Bar kitties! I'd drink there. Oh... They look like a sweet bunch. Those kitties are so cute! I'd love to visit that pub! So cool! 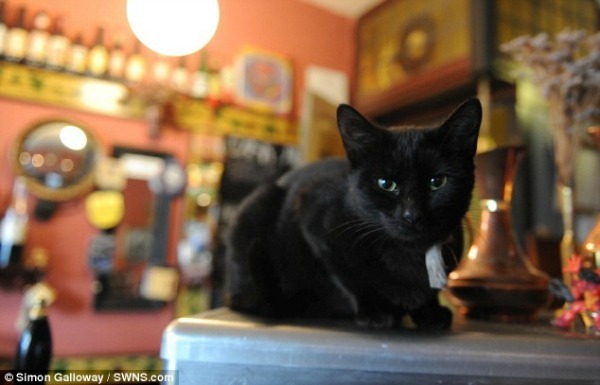 I'm loving this craze of cat cafes and now cat pubs! Those cats are beautiful too. Will be adding this to my long list of cool places to visit! 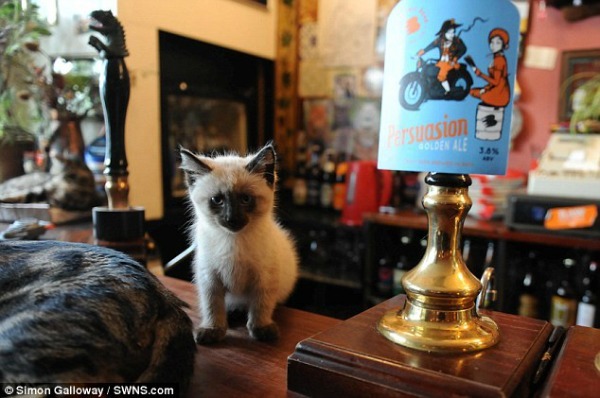 First time I'm hearing of cat pubs. I'm not a beer fan, so this doesn't appeal to me, but the cats are so cute! We just read about this pub a few days ago! Mommy has besn wanting to go to England, and now she has the purrfect excuse! beautiful kitties!!!! Just an FYI: don't know if it is my computer or not, but I have an awful time loading your blog. I can barely leave a comment because it totally locks up. Could be on my end, but just in case, I thought I would let you know. J'aime bien l'air de petit voyou du tigré sur l'avant dernière photo. Il a l'air vraiment bien dans ses coussinets. That would be a real fun place to hang out. What lovely kittehs! Thank you for sharing them with us at Photo Friday! How cute! In the United States, there is a library where you can "cuddle" with kittens up for adoption, and Uber will deliver cats on certain days. 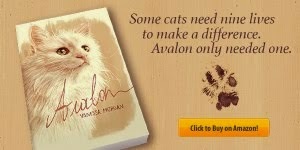 I hope this leads to cats finding a good home. They're so precious! Thanks for sharing at My Flagstaff Home! 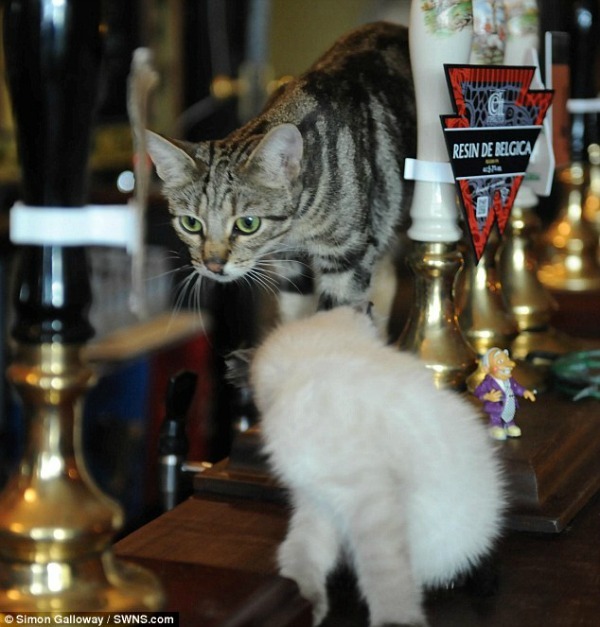 An English pub full of kitties? Who wouldn't want to go?